The leader of the Independent People Of Biafra (IPOB), Nnamdi Kanu, has released another claim to back his allegation that President Muhammadu Buhari is allegedly not alive. 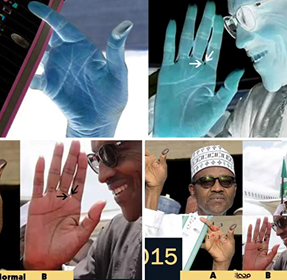 He alleged that the palm and finger print of Buhari has changed after the 2015 election. He had alleged that the ‘real’ President Buhari was dead and allegedly imposed by one Jubril from Sudan. Though Buhari denied the claim, Nnamdi Kanu insisted that the ruling Buhari is from Sudan, adding that “the man in Poland is not the real President Muhammadu Buhari. Does it mean the right palm of Nigeria’s president also changes as the years go by? 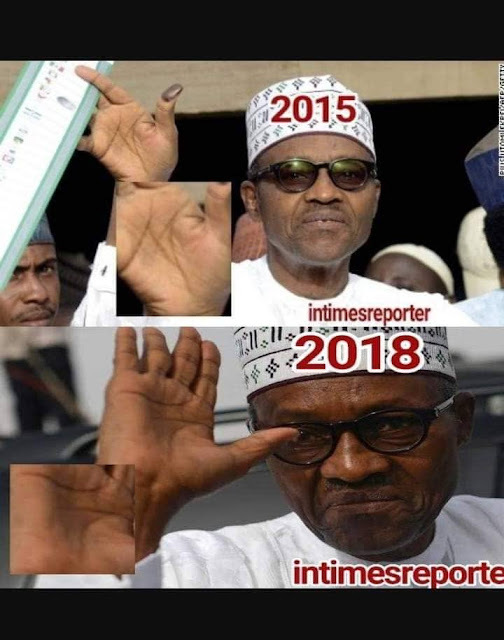 Examine the marks on his palm in 2015 after voting, compare it with the marks on his palm in 2018 to understand the gravity of the fraud going on in Nigeria. A Nigerian, living in Poland at the interactive session, had wanted to know if he (President Buhari) was real or the much talked about ‘‘Jubril from Sudan’’ -his supposed double. President Buhari described the authors of the confusion about him as ‘‘ignorant and irreligious’’. He said: ‘‘A lot of people hoped that I died during my ill health. Some even reached out to the Vice President to consider them to be his deputy because they assumed I was dead.